Tonsils are designed to help young children fend off infections to the ear, nose and throat and as you get older, they shrink in size so that by the time you’re in your late teens, they are barely visible. This is why tonsil removal is more common in childhood and the operation is medically referred to as a tonsillectomy. Some children suffer from tonsillitis frequently throughout their early years whenever they catch a cold or experience a bout of flu’. Tonsillitis causes the tonsils to become infected which causes them to swell up and, as a direct consequence, a child can experience a sore throat, headaches and can cause difficulty in breathing which can also lead to sleeplessness. 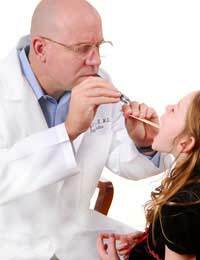 In this instance, especially if it recurs frequently, your local GP may refer your child to a specialist who is likely to advise you that the tonsils should be removed. The operation is carried out under general anaesthetic which means your child will be put to sleep and will not be aware of anything taking place. These days, there are a number of different ways for removing tonsils. The traditional method of using a special surgical blade to cut the tonsils out is still used but this has also been complemented by the use lasers or ultrasonic waves or by diathermy which is a form of electrical current which emits heat which is used to cut out the tonsils. Both of these methods work similarly in that after the tonsils are cut out then, whether it’s via electric or laser treatment, the blood vessels are then sealed to prevent further bleeding. The actual operation itself should only take around half an hour to perform. Your child will naturally feel groggy as they come around from the effects of the anaesthetic and this might mean that they vomit. This is completely normal, however. They’ll probably experience a sore throat, maybe earache and a stiffening of the jaw and once again, these are all perfectly normal reactions after a tonsillectomy has been carried out. Your child will be given pain relief however and this might continue for up to a week or slightly longer after the operation. Although you should be guided by how your child is feeling, you should encourage them to eat and drink as soon as they’re ready to do that starting off with clear fluids such as water or even apple juice. As they regain their appetite, things like ice cream is ideal to give them to eat initially as they start to get used to eating solid foods again. Usually, your child can go home after an overnight stay. Firstly, it’s important to mention that you’re bound to be inquisitive about looking into the back of your child’s throat so you shouldn’t worry if, after about 12 hours, you spot a thin layer of yellow-ish coloured skin appearing where the tonsils once were. This, too, is completely normal as it’s just a new layer of skin growing over the wound and is not a sign of any infection. Once your child comes home, if they still experience some pain, it’s fine to give them over the counter pain killers which are suitable for their age. It will often help them with their food if you administer the pain killers half an hour or so before they’re due to eat as they’re more likely to return to their normal eating regime quicker if they’re hardly experiencing any pain. You should keep your child off school for a few days to avoid the risk of any infection and keep them away from any people who may be suffering with coughs and colds and well away from any smoky places which could cause your child to cough which might be extremely uncomfortable and quite painful for them. Apart from these minor precautions, your child should be able to resume their usual activities within 3 or 4 days, even if they’re still experiencing a little post-operative pain. If, however, they develop any bleeding in the throat or nose or their temperature starts to rise above normal or they simply cannot face drinking at all, it’s important that you contact your GP or the hospital so that they can check if there have been any complications. And, although this is article focuses on children, some adults do require tonsillectomies and the information and advice is very much applicable to all age groups.